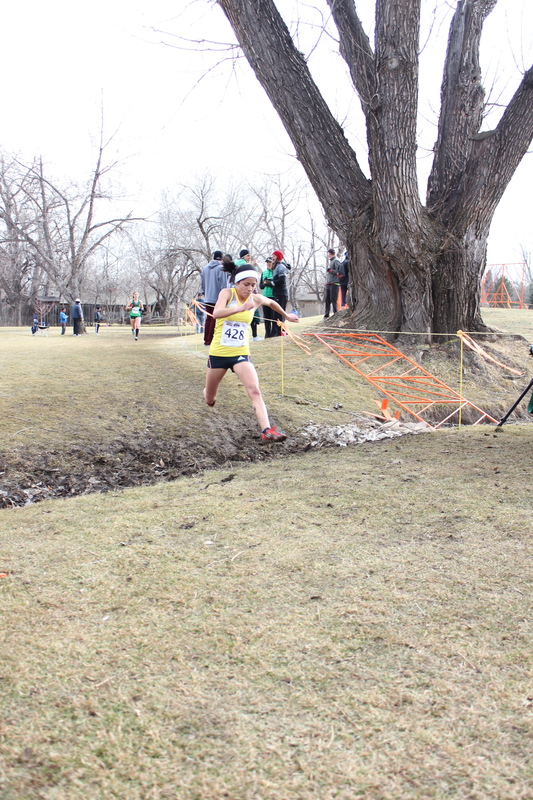 A few weeks ago Shamala reminded me that the Flatirons Golf Course, Boulder CO. was the host venue for the 2014 USA Cross Country Championships and that masters races were on the program. We were planning to go to Boulder to spend some time in our apartment there so it made sense to sign up. It also presented me with an opportunity to try and better the silver medal I collected in the M45-49 category at the British Masters Cross Country Championships in 2011. To get my spot on the start line I renewed my USA Track and Field (USATF) membership and was pleased to note that as I was now a permanent resident I could compete in the championship – though not pick up any prize money! 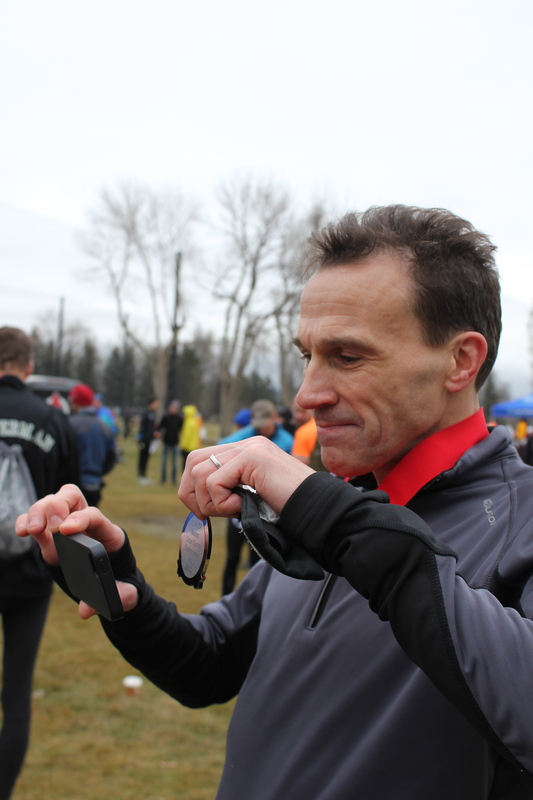 A few years ago I ran in an event that incorporated the USATF Masters Half Marathon Championships – and on that occasion had to return my medal, seconds after receiving it, as I was only a ‘resident alien’. The day promised to be unseasonably warm but turned out to be seasonably cold, thanks to a strong chilling wind. The course was fast – an almost pancake flat golf course of well-groomed grass spiced with a few wet patches, ankle deep mud on one 180 degree corner and a mini creek crossing. 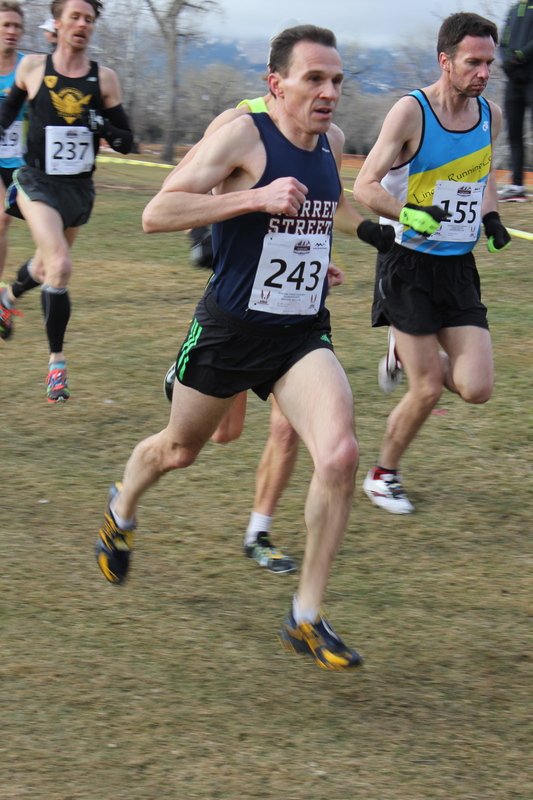 The men’s masters’ race was 8k, four laps of 2k. Runners had very different approaches to crossing the little creek. On the basis of some pre-race research I figured a top 3 placing was doable but that top spot was unlikely as Simon Gutierrez, a prolific master’s runner who on the basis of recent races looked likely to beat me comfortably, was entered. My homework proved accurate. I placed third M45-49 in 27:58, 9th overall and over 40 seconds behind Gutierrez (see the video here). But then to my surprise I was awarded silver at the awards ceremony, beamed live to my nephews in the UK thanks to Face Time, as the second placed M45-49 runner, Ecuadorian Olympian Silvio Guerra, did not seem to qualify. 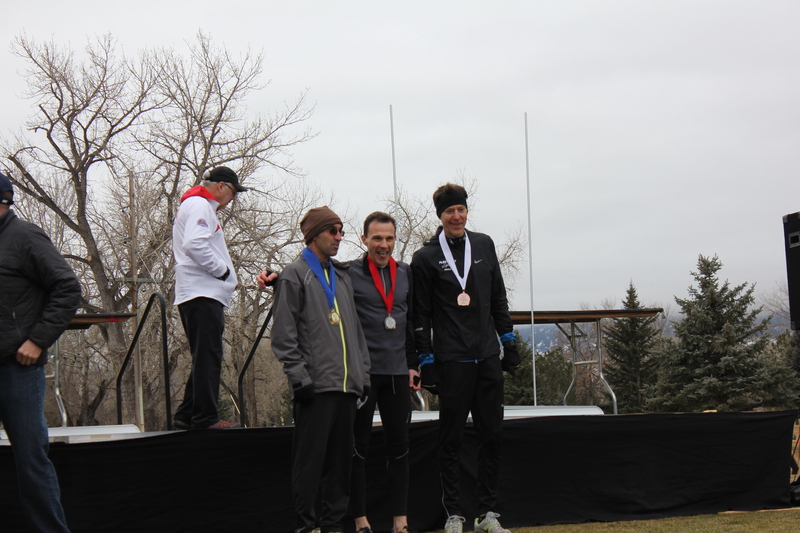 The first three in the M45-49 age group. Showing my nephews in the UK my medal via Face Time. My race went largely to plan. I got a clean start and settled behind the lead group of 8-10 runners. I could see, thanks to age group patches on the backs of all runners, three M45-49s ahead of me on the opening lap (the rest were younger!). I tried to stay in touch with this group as long as possible. Mid-way through the second lap I started to drift off the back but shortly before the start of lap 3 I passed a M45-49 runner, placing me in medal contention. And that’s where I stayed despite my lap splits showing I slowed down significantly. For once the legs held out but the lungs gave in to the effects of the mile high altitude. Hanging on to the lead pack in the early stages of the race. Sham and I stuck around for the main course (here’s the video coverage) – the men’s and women’s open events. The bitterly cold wind made spectating a bigger test of endurance than the race itself. Free coffee, bagels and Danish pastries from the athlete’s tent – actually the golf buggy garage – helped pass the time and provide some relief from the cold. 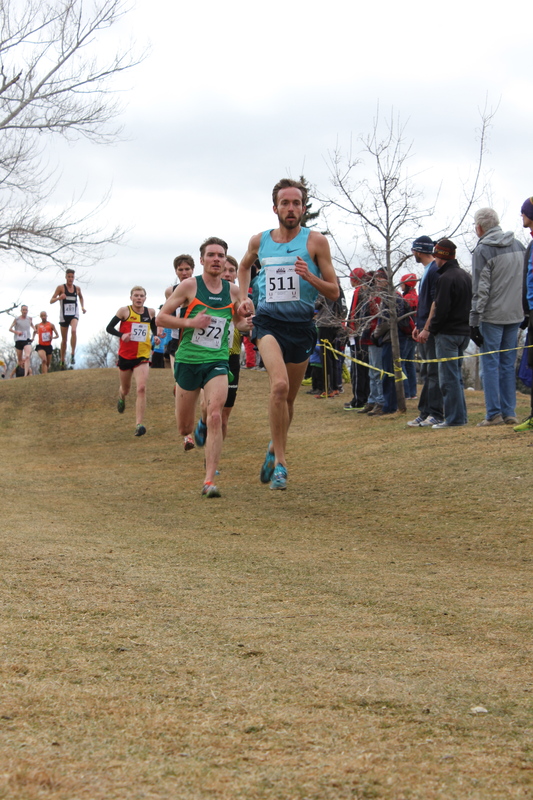 Chris Derrick, who won his first USA Cross Country Championship title in 2013, arrived in Boulder as favorite to win. The Portland-based runner, 11th in last year’s World Cross Country Championships and fresh from winning the Bupa Great Edinburgh Cross Country 2014, bided his time in the opening laps. But at 6k he surged, dropping all bar a few rivals, before ultimately running solo around the 8k mark. Over the final two miles of the race, Derrick extended his lead and crossed the tape in 36:14, 20 seconds ahead of his nearest rival. Chris Derrick, the winner of the Senior Men’s race, beginning starting to surge away. In the women’s 8 km race, there were a few surprising results, including a breakthrough performance for Flagstaff-based Amy Van Alstine. From the gun, a pack of a dozen women grouped up and ran together for much of the first half of the race, including pre-race favorite Olympian Jenny Simpson. Before the 6k point Van Alstine surged ahead and over the final 2k pushed hard and opened up a big lead, finishing some 22 seconds ahead of the runner-up Simpson in 27:35. 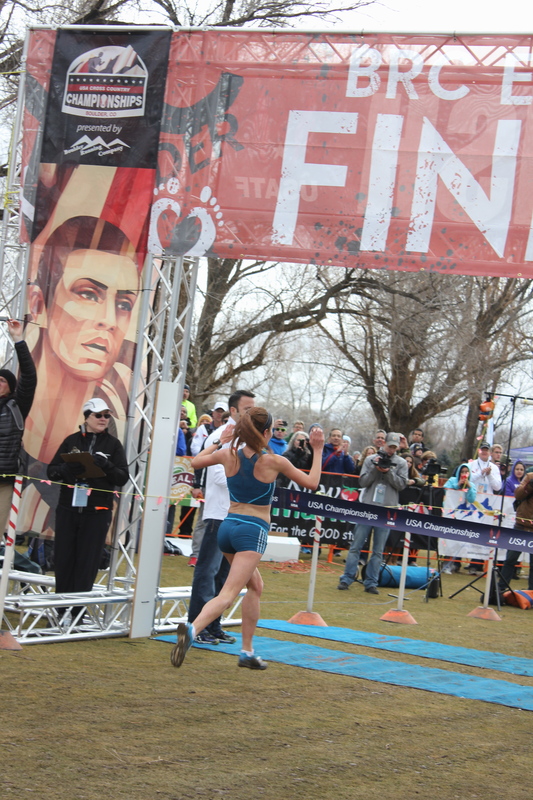 Amy Van Alstine crossing the finish line in a surprise win over pre-race favorite Jenny Simpson. Sham and I spent most of the main races jogging around the infield area. This enabled us to catch athletes 2-3 times per lap. As soon as Chris passed us in the finishing straight we made a break for the official athlete’s car park some 600m away. We hopped on a waiting shuttle bus for the short ride, only to find Kara Goucher and family, Boulder residents again, seated just behind the driver. That evening we celebrated my second national individual silver medal like only runners can – with modest amounts of alcohol and food at 4580 Broadway – content that my injury is behind me. At least for now. One week after the event USATF contacted me to advise that they had mistakenly awarded me the medal. They had overlooked the fact that my USATF profile stated that I was a UK citizen and as a non-US citizen I was not eligible to win a USATF award. The medal is now in the post! This entry was posted in Boulder, Races, Running and tagged Boulder, Cross Country, Race, USATF. Bookmark the permalink.